Sometimes helping hands can hurt—and it is those unexpectedly harmful hands that are at the center of the mystery unraveling in debut author Carole Sojka’s compelling novel, A Reason to Kill. When nine strangers convene on a Florida beach to observe and protect the endangered loggerhead turtles nesting there, one dies of poison and another turns up dead soon after—so, who among the remaining wildlife supporters is also a killer? Recently transferred to the Burgess Beach Police Department, Detective Andrea “Andi” Battaglia is looking to prove herself to her new colleagues, but the more clues she collects, the more secrets—and suspects—she uncovers, and her hopes of a quick result dwindle. As she works to figure out whodunit on the beach and beyond, she also struggles with her mother’s critical illness, her own feelings of inadequacy, and her misgivings about her growing attraction to another cop. 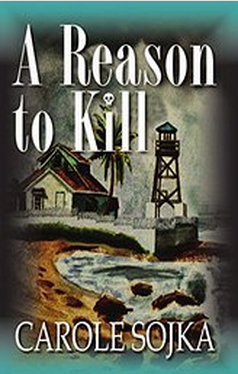 An intensely intriguing mystery with murders committed off the page, A Reason to Kill is sure to appeal to fans of intelligent suspense fiction and leave them eagerly awaiting Sojka’s next book.